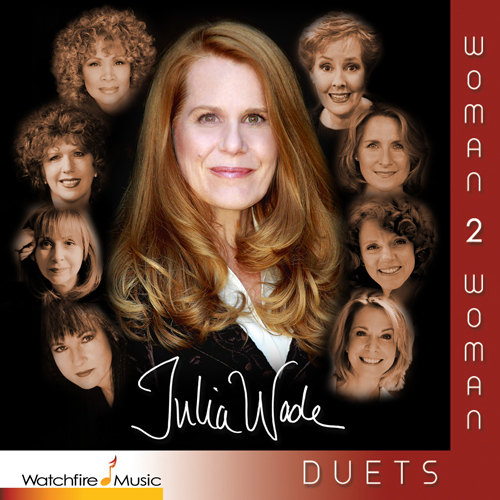 Fun, thought provoking and definitely inspirational, here are 10 Duets sung by Julia and her wondrous band of super talented lady friends. Eavesdrop on scintillating musical conversations between wise women in the life of Julia Wade and explore subjects like passion, sisterhood, hunger, comedy, God, femininity, music, life and death. It’s a wide variety of women, so it’s also a wide variety of musical styles ranging from Classical Crossover to Rock-a-billy to Broadway and much that lies between. Julia handles them all with a magical voice and an open heart. Composed, Produced and Orchestrated by Peter Link. Ya’ don’t have to be a comic to make ‘em laugh, Julia. comedienne is a lot like being a singer. Just make the best of what cha got! I’m here for ya’, girl. Don’t think twice, just bring it! And that’s what’s at the heart of it all. And at the same time be another? With this piece of information? When at the same time God is perfect? Why can’t we just calm the rabbit down? What if we changed the ultimate aim? EB Yeah, what if we changed the game? There is not the shadow of a doubt! Hey Girlfriend, let’s go get our nails done! I love you, Mister Mom. You clean the house, while I slave away in the office. Just don’t be tryin’ on none of my dresses!